May 2nd, 2008 will be a date I will never forget. I also think most comic book and film geeks worldwide won't forget this date. This was the day that everything changed in the industry. The entire way of blockbuster filmmaking was altered. The possibilities in which franchises in film are made somehow became limitless once Samuel L. Jackson came out of the shadows, introducing himself as Nick Fury and discussing The Avengers Initiative with Robert Downey Jr.s Tony Stark. Ever since, Disney has been formulating a universe on film, stretching onto television, sometimes running across distribution companies. Ever since that glorious evening I had back in 2008, I have been enjoying this wild ride. I mention this because, when Kevin Feige took the stage somehow hidden in California in October of 2014, he announced "Avengers: Infinity War," which at the time was going to be one giant movie cut in half. He announced that these two films would be an culmination of everything that has happened since "Iron Man." Now, "Avengers: Infinity War" is one film and "Avengers 4" will apparently be a separate film with its own story, even though everyone in "Infinity War" will show up in "Avengers 4." No matter. The next two Avenger movies will be closing out a huge chunk of storytelling that's been told since 2008 and it will set the stage for...whatever's ahead. While I can't wait to see what's next, and how the universe will be change in 2020, there is also a melancholy sense taking over. I know some people are getting some superhero movie fatigue. I can understand that. If you haven't grown up loving these characters, you may not understand just how awesome it is to be fan of this stuff, how fun its been to be a fan of this stuff for almost a decade now. I can see when each year is flooded with all sorts of superhero movies that it may seem a little much. But for me, it's not an option. I grew loving superhero stories. I still love superhero stories. It's just the way I'm wired. The Marvel Cinematic Universe has been my own personal "Star Wars." This all matters very much to me, and I hope and pray I am singing these same praises about the DCEU at some point. I love that we live in a world right now where these movies can be made, and that they are taken seriously. 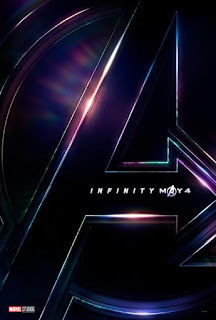 Ever since Feige announced his Phase Three plans on that day in October 2014, I have been keeping a close eye out for "Avengers: Infinity War." The movie where Thanos' (Josh Brolin) plot to collect all the Infinity Stones would come to a head, and would feature literally every Marvel hero introduced so far to challenge him. The trailer is everything I hoped we would get and more. I only have to patiently a little while longer, for now, this incredible trailer will do. In January, I have a big announcement regarding the Marvel Cinematic Universe. Something that will celebrate all the great work Disney and Marvel have done, something I think fans of this series will enjoy. So be sure to check back in the new year. 2018 will be a year of many celebrations for me, and since this is possibly the biggest film franchise I have lived through in its entirety so far, I want to write something special leading up to "Infinity War." The future is so cool! What a great trailer! Thanos looks awesome and I think the big lead up since 2012 will pay off big time. The bearded Steve Rogers is cool. That battle in Wakanda looks EPIC! I sure hope Vision isn't dying in this! But what is with that human form of his? And is he finally dating Wanda? We didn't get too much, just a taste. This is a good teaser trailer. I don't think I could piece together plot details yet. While I liked the beginning of the trailer with the various Avengers saying the famous Nick Fury line. Although, I would have loved if they said the famous Avengers issue one line. The same line Samuel L. Jackson said in the first Avengers teaser trailer. Missed opportunity there! Everything is coming together nice. I can't wait.